Thanet Life: Good Shape to Weather the Storm? Reading Thanet South MP, (Labour) Steve Ladyman's column in the local paper, my jaw bounced-off the table a couple of times, before I turned-on my computer to write this weblog entry. I’m surprised to see Mr Ladyman so enthusiastically joining his party in a chorus of ‘Always look on the bright side of life’ in respect of the increasingly perilous state of the UK economy and its implications for the people of Thanet. Contrary, to the Bank of England, the CBI, the IMF and quite possibly the MCC and the RNIB, Steve, Gordon, Alistair and a handful of other members of our Government, believe that the UK is "Well-placed" to weather the present recession or was that 'depression'; it's getting hard to tell but there’s a difference. In a recession, you know somebody who’s been made unemployed in a depression, you’re unemployed too! Very soon I’m going to need more than both hands to count the people I know who have either lost their jobs or look very likely to lose them soon. Following the next election, Mr Ladyman, will, more likely join several hundred other Labour Members of Parliament in a growing unemployment queue; that's unless he's elevated to the House of Lords as a peer of the realm, with its lifetime of lunches, rewards and corporate-sponsored 'consultancy' opportunities. As a retired Member of Parliament, he’ll enjoy an indexed, rock-solid and generous Parliamentary pension that you and I – if we are still working - will have to pay for through our steadily rising taxes. The true responsibility for the near bankrupt debt-ridden mess in which the nation finds itself will pass to others to try and correct over the next twenty years or more if predictions are correct. The world in which we live, will look a very different place once this turbulent chapter in its economic history has passed, no different in some respects to the painful disruption of the 1930s and 1970s. As a nation saddled with debt and living beyond our means, we are now on a par with Pakistan, as was pointed-out during 'Prime Minister's Question Time' in Parliament last week and even the French are now openly deriding our Gordon's 'prudent fiscal policy' as a recipe for disaster. In good shape? Well I'm sure you will be Steve but with unemployment growing steadily both nationally and in your own constituency I'm not sure the people of Thanet will see the world through such rose-tinted spectacles. However, Government will not be able to escape the real figures in the pre-budget report and those should put an end, once and for all, the insistence that this is all someone else's fault and that the UK economy can defy the gravity of reckless public spending and institutional banking collapse. 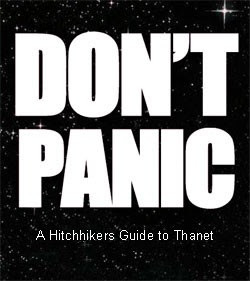 When it's all over, perhaps Mr Ladyman should follow the example of Douglas Adam's novel, 'The Hitchhiker's Guide to the Galaxy' and entitle his very last local paper column as a sitting member of Parliament: "Goodbye and thanks for all the fish!" A very Conservative view point as ever Simon. Naturally the Conservatives will point the gloating finger and lay the blame. However, in the wider political picture this is a capitalist crisis and has well and truly finished off any remnants of Thatcherism. Personaly, the only thing I think New Labour has done wrong is they had too much trust and faith in capitalism when it seemed to be working. We all now know it doesn't. Still banging on about Margaret Thatcher Tony, isn't it time you changed the record? Nu Labour have had over a decade in office and here we are bankrupt again. It was ever thus. Did you somehow sleep through the seventies? So it's a capitalist crisis. What's your solution then? Nationalisation? Stalin and Labour both tried that and failed. As for Mr. Ladyman he won't even have Pfizer to fall back on now, cue the worlds smallest violin.